It's during this time of year that most of us are feeling the most generous. We want to help others in need. Things that are basics to us are luxuries to others. In the midst of the retail frenzy following Thanksgiving, Giving Tuesday provides an opportunity to make a difference in the lives of others by focusing on charitable giving. On Dec. 1, 2015 – the 4th annual #GivingTuesday – World Vision will partner with Thirty-One Gifts to help charitable donations make twice the impact. On #GivingTuesday, every donation made by phone (1-888-511-6588) or online (Worldvisiongifts.org) to World Vision will be matched by Thirty-One Gifts – a direct-selling company offering totes, purses and more – with a donation of one of their products, such as a tote bag or blanket, up to a total of $1MM worth of products for women and girls in need around the world. Bags like the Zip-Top Organizing Utility Tote from Thirty-One Gifts have recently been distributed to volunteers in Burundi who use the totes to carry materials for educating families about malnutrition. Before receiving the totes, volunteers like Renathe Kabageni (shown in first photo) carried all of their materials and equipment by hand. The simple gift of these tote bags preserves teaching materials and makes it easier for volunteers to visit each home. Since it began in 1996, the World Vision Gift Catalog has grown in popularity as a gift-giving alternative; featuring over 100 ways to improve the lives of children through gifts such as: clean water, food, medicine, education, job training and small business loans, among others. Gifts range in price from $16 to $39,000 and can be made in a loved one’s name. Last year alone more than 822,000 people were helped through the Catalog. To order from World Vision’s Gift Catalog, visit http://bit.ly/1gcUYvT or call 855-WV-GIFTS. Thirty-One Gifts was founded on the principle of helping women and is known for their charitable heart. In 2012 they founded a philanthropic initiative called Thirty-One Gives and to-date has donated more than $80 million in cash and products to nonprofit organizations that empower women and girls and support families. The Zip-Top Organizing Utility Tote from the Thirty-One Gives line, gives back as well with a donation of 31 cents from every sale going to a philanthropic fund. It also delivers an inspiring message on the inside with encouraging words for women. For more information, visit their website at www.thirtyonegifts.com. 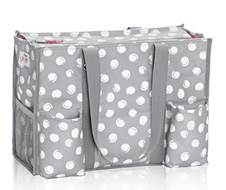 I received a Zip-Top Organizing Utility Tote in the U R U Swirl Dot pattern. This roomy tote holds plenty on the inside, and has seven pockets on the outside. There's a zipper on top, and two large straps on the side for easy carrying. I've recently been using it to carry my adult coloring books and supplies. I like how it keeps everything organized and all in one place. The bag is gray with white circle swirls. I've purchased from Thirty-One Gifts before, and am pleased with this new addition I received. The company has never failed me with their merchandise, and I adore that the company gives back to those in need. One person will win a Zip-Top Organizing Utility Tote with free embroidery personalization. I have not purchased from either one but would like too for I like that it goes to help others. I have not purchased from either. I have never purchased from Thirty One Gifts---I am new to hearing about them. I have made a purchase from World Vision some years ago. I gave a donation for school supplies in the name of the school I taught for as a way to "pay forward" for the holidays as art of our school holiday program. No I have not purchased but would love one. I just learned about both of them so I haven't purchased yet but I am looking into them for Christmas gifts! Yes I have purchased from Thirty-One Gifts but I haven't from World Vision before. I have not heard of either site before. So no I have not purchased from either. They both look like wonderful sites with a purpose. I haven't purchased from either company yet. I have purchased from 31 before. So far I have not purchased from either but I would love to do so. No I haven't purchased for either. But I do blog posts for World Vision every year. I have never bought anything from either one but they have some adorable stuff! I have purchased from Thirty One gifts. I have never purchased from either one, but they look like great products! I've never purchased from ThirtyOne, but I have from World Vision. I have not, but a gift from World Vision is on my Christmas list. I have not purchased yet. I do have plans to purchase in the future but money has been so tight. They have such great items. I have heard of both, but have never ordered from either! I've not purchased from either before. 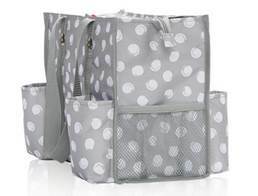 I've purchased lots of things from Thirty-One - I love their products. I have never purchased from World Vision before. No, I haven't purchased from either one before. I have purchased several items from Thirty One Gifts, but not from world vision. I haven't, but I think they would be so handy to have! I haven't ever purchased from either, but I love their items. I have purchased for thirty-one before. I love their products! I have not purchased from Thirty-One Gifts and World Vision before but I would love to! I have one thirty-one bag and I love it! I'd love to have another! I have not purchased from World Vision. i have purchased from thirty one! I was gifted some items from thirty-one but I've never ordered from either yet. I have not purchased from thirty one before but I have purchased the Prosperity Cinnamon from World Vision and loved it! No, I haven't purchased from either. No, I haven't purchased from those companies yet. I've never purchased from them before. I've supported World Vision, but I haven't purchased a gift yet. I have purchased from Thirty-one in the past. I've purchase from thirty-one gifts before, but not World Vision. I have never purchased from world vision but I have bought many things from thirty-one and have always been very happy. I have not purchased from them before. I have not ordered from either. I have purchased a couple items from Thirty One before. I have ordered from 31 Gifts, but not from World Vision. Thanks! I love Thirty-one! I have several Thirty one items and love them all. I have never purchased from 31 or the world vision. I have a lunch bag from 31 that I received as a gift that I love. Yes, I have purchased from Thirty-One in the past! I love the quality of their products! I have a World Vision silk scarf that I love. I have not purchased from them but the items look great. I have never purchased from either, but I have received a gift from World Vision. I have purchased from Thirty-One-I have a great tote bag that goes with me when I travel. No I am sorry to say that I have not, but will try in the future. I have never purchased from Thirty-One or WorldVision but I will have to look into both! I have never purchased from Thirty-One Gifts and/or World Vision before. I've looked at the Thirty-One bags at length, but never ended up purchasing. i have not but i have my eye on a lot of things. I might , have purchased from World Vision awhile back but I can't be certain. I have not yet purchased from Thirty-One Gifts, but have been checking them out since I learned about them here. I have never purchased from Thirty-One gifts or World Vision before. My sister bought me 31, but i never have bought myself. No i have not purchased from them before but I have heard of them. No I've never purchased from them, but I probably will after reading your post! I have never purchased from either company. yes i have purchased from 31 before, i love their products. Love Thirty-One... such great quality and always an awesome gift choice! I haven't purchased from there before. i have bought 31 stuff before and thanks so much for the chances to win. I confess that I have never purchased a product from either company / organization but plan to share this giveaway throughout the internet and offline! As fort the little I have brought since entering sweepstakes; a great deal has to be based on that of an injury that was the result of a car and pedestrian accident! Another is that I plan to save / support my single mother some day in that of efforts to give back what she has given to me! no i havent purchased from either one yet. i would like to though. No, I have not purchased from either site before! I have not ever purchased from Thirty-One Gifts and/or World Vision before. No but I had admired World Vision products for awhile now! I haven't ordered from either. I have not yet purchased from either place. I have not purchased from either of them. I haven't purchased from either. I did review a Thrity-One bag once though and I really liked it. I haven't purchased from Thirty-One Gifts or World Vision. I've bought from thirty one but not world vision. i have, i got a giant tote bag which i use for beach trips and yarn storage. i would love to have this for my knitting/crochet projects! I have never purchased from either company but have been admiring the products they carry. Yes I love thirty one gifts! I have a few of the large utility totes and I love their wallets! I have ordered from Thirty-One Gifts before, but it's been awhile.